It’s the most wonderful time of the year and time to share my woodsy Christmas tablescape with you. My dinnerware was a gift from my late father-in-law. I love the dishes so much that I use pieces of the set every single year. 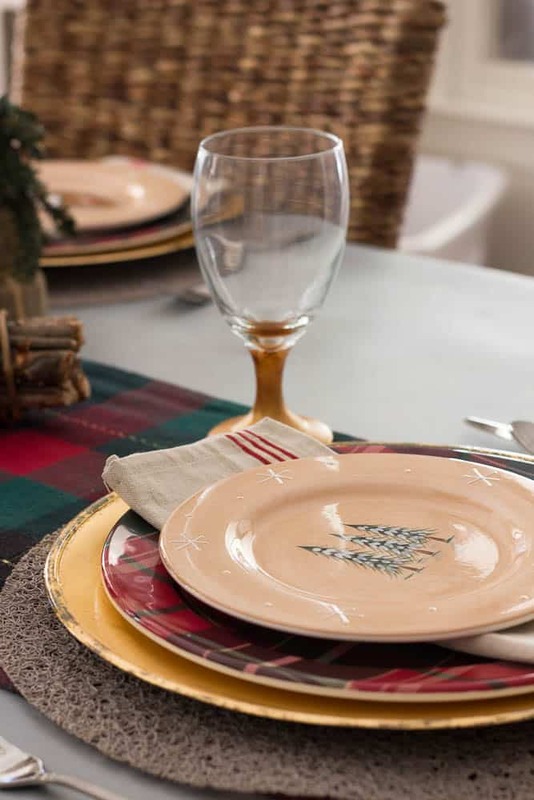 This year I am pairing the dishes with new plaid plates, a DIY plaid runner, and some decor for a woodsy Christmas tablescape. I am so excited to be part of this Christmas Table Home Tour where a group of bloggers are sharing how they decorate their tables for the holidays. I want to thank Chloe from Celebrate and Decorate for including me in this tour. I love visiting home tours because I usually find inspiration for my home and we hope you find some inspiration for your home! My inspiration for my table are these woodsy Christmas plates that my late father-in-law picked out for us as our gift for our first Christmas together. I love them now as much as I did then. They came from Target and I use pieces of this set and pair them with something different every year. This year I am pairing the salad plates with these awesome plaid plates from HomeGoods. Don’t tell anyone that the plaid plates are plastic. I don’t mind purchasing plastic when I can because they are easier to store. I can’t afford to purchase everything for my table all at once so I try to use items that I already have, thrifted items, and a few items purchased new. I found the napkins at HomeGoods and I used some gold chargers that I found at a thrift store. I would love to have new placemats but they were not in the budget so I used some that I already had. Last year, I made this runner with the fringe from a thrifted poncho. You can view the DIY Table Runner tutorial. The acorns were purchased a few years ago from a thrift store and I think they look perfect in a dough bowl for a woodsy Christmas table centerpiece. I used two flocked trees that I found at HomeGoods for the centerpiece also. 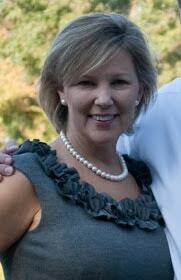 I am using some little trees and adding name tags to each placesetting. I made all the wreaths for the backs of the chairs from a Dollar Store garland and some ribbon. Pretty cheap decor right here! I wanted a rustic and woodsy feel to the kitchen and I am pretty happy with the woodsy Christmas table. Don’t forget to check out the other blogger’s tables and I hope you get some DIY ideas and some inspiration from our tables. 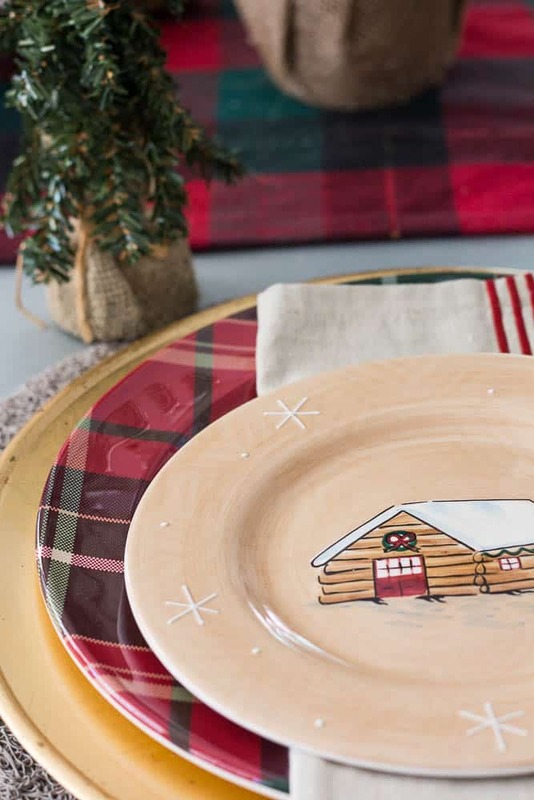 Adorable plates and they look perfect paired with your plaid layers and accents! Your chair wreaths are a festive addition too! I love the fact that you put this table together with so many thrifted items, Sherry – that makes my vintage soul smile. That table runner looks fantastic and is a great base for your woodsy theme. Your gifted plates are great – I like all the various designs, and those tiny trees for place cards are adorable (would love to know your source for those). I love a table which is put together with the “love” from others like your father-in-law and the love that comes from rescuing pieces from thrift stores. 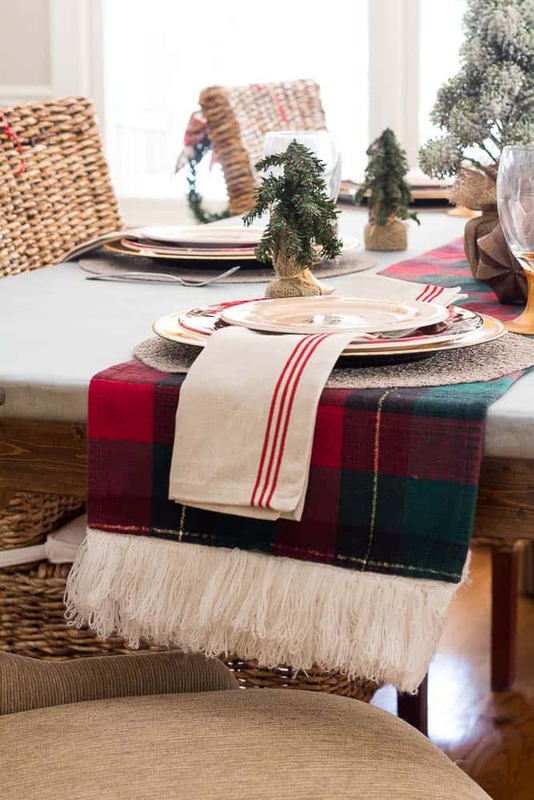 It is brilliant to use your poncho fringe on your plaid table runner. It adds a feeling of snow to your woodsy table. The mixture of pinecones and plaid makes for such a feeling of cozy up by the fireplace moments. Sherry, those plates from your father~in~law are so special, not just because they are super cute, but also because of the memories that they hold. What a wonderful treasure to use every year. 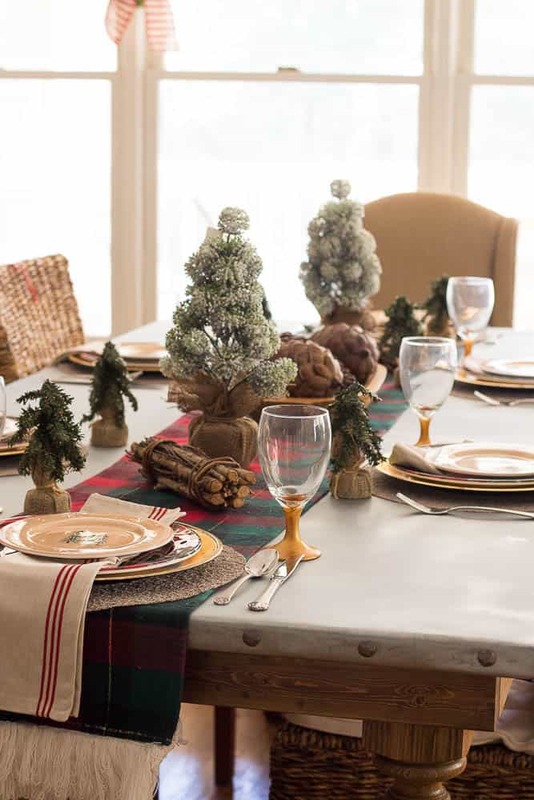 The plaid runner is a great foundation for your tablescape and I love the burlap around the little Christmas trees. What a lovely setting. Great to be a part of the tablescape with you again. Oh lovely to have those special dishes to use every year. I really enjoy your woodland theme and you have executed it beautifully. Your use of thrift store finds is truly an inspiration, as it just goes to show a beautifully set table does not have to be expensive! Oh, and the bows on the back of the chairs is an idea I will be borrowing. Such a nice touch! Beautifully done, I love thrift store finds! Love love your plaid plates! And what a special memory for the plates your father in law gave you. I love rustic woodsy themed tables. Rusty, woodsy and very inviting. So many of my favorite items on your table. I shall be eternally in love with plaid and the runner you made is gorgeous. Those gigantic acorns in the dough bowl picture perfect as are the flocked trees. The plates from your father-in-law are timeless and you’ll get lots of use from them. Merry Christmas! So fun to see how you’ve decorated your zinc table for this holiday – love that table! You’ve created a perfect mix of old, new and thrifted items for a wonderfully woodsy tablescape. 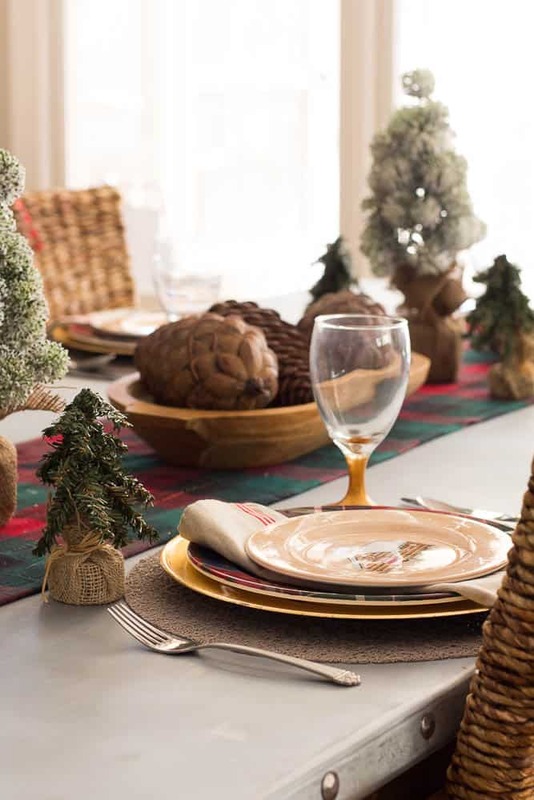 The pine cone centerpiece is terrific and looks lovely on your pretty table runner. Those plastic plaid plates are fantastic and a great addition to the plate stack you’ve put together. I really enjoyed my stop here on the Blog Hop! The table you made is absolutely the highlight of your beautiful holiday table. It is the foundation that makes everything look amazing! Still in awe that you created such a beautiful table!! Happy holidays my friend! Sherry, this is lovely and brings to mind the story “The Mitten”! I love your mix of dinnerware of all kinds – I do exactly the same thing! I love mixing and matching and finding new ways to put things together. You did a fabulous job of incorporating vintage with new, all with just the right touch of nostalgia and tradition. Great job! Sherry, I love those plates you got from your father-in-law. I know they hold dear memories for you every time you use them. Your woodsy theme looks great, and I still say I need to go thrift shopping with you! Sherry, your table is elegant and festive, with many gorgeous details. 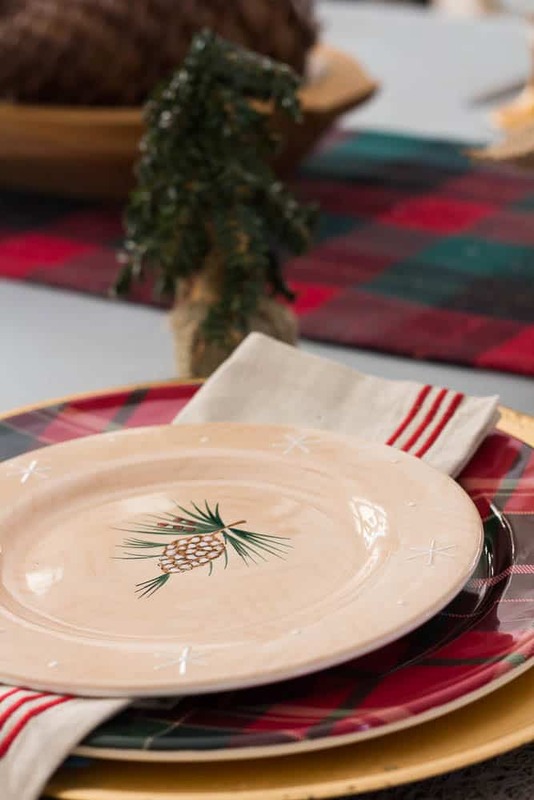 The stacked plates tell a story of past holidays, and the runner is a lovely backdrop for the exquisite woodsy items. Love the chair wreaths! You really have a knack for creating beautiful tables—and the table itself is a stunning backdrop for your artistry. Details like the bundled twigs and pine cones are genius. Hope you have a wonderful Christmas! The plaid runner that you made looks great across that beautiful table of yours, along with the very textured wicker chairs it makes for a great natural woodsy setting. I like the simple bundle of twigs, they just fit with the rustic motif of the plates your father-in-law gifted you. What a wonderful stop on the blog hop! What a beautiful, warm, and inviting holiday table. I know that you must treasure the gifted Christmas plates from your father-in-law. All of your touches create such a stunning holiday table. I hope that you and your family have a very Merry Christmas!!! I love those giant pinecones! Frosted trees look so magical too! I love the rustic woodsy vibe of this table. It really has a modern feel. That runner is so cozy too! Sherry, I love the idea that your Father in Law purchased those plates for you to celebrate your first Christmas together…I don’t mean to stereotype, but that’s not a typical ‘man’ idea. He was clearly a thoughtful gentleman! And they are perfect for your Woodsy Christmas table! I am also blown away (but knowing you not really shocked) that you used fringe from a thrift store poncho to finish that great runner. You are truly my repurposing heroine. Merry Merry Christmas my dear, sweet friend. There are so many great things going on with this tablescape, where do I being? I really love the way you have decorated the back of the chairs, and that always makes for a special occasion table. The elegant yet rustic look of the centerpiece with the small stick bundles, and the large pinecones is very pretty. The snow brushed trees and your beautiful dishes keep the Christmas theme front at center. Thank you very much for being part of the Christmas tablescape blog hop! where do I begin? * blogging too late into the night again! beautiful table and beautiful photos! Those little salad plates are my favourite. Happy holidays! I’ve enjoyed touring with you. Nice to meet you. I loved reading the story on how the elements used on your pretty table came together. Thrifted items, plates gifted from your late Father-In-Law, handmade runner.- A table with a story to tell for sure. That table runner is beautiful and is a great base for your woodsy theme. I enjoyed my visit here very much. It was fun blog hopping with you! Merry Christmas.